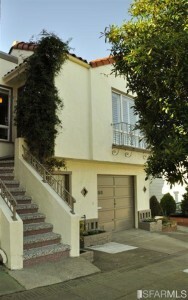 Represented Buyer – Pristine remodeled 1940’s light filled home. Hardwood floors, period detail and open floor plan make this a must see. Kitchen and baths nicely remodeled. Downstairs boasts large bonus room with 2nd bath. Dual pane windows and shutters add to its charming appeal. Money saving solar panels on roof. Large landscaped garden is perfect for entertaining. Move in ready. 1 block to scenic McLaren Park.